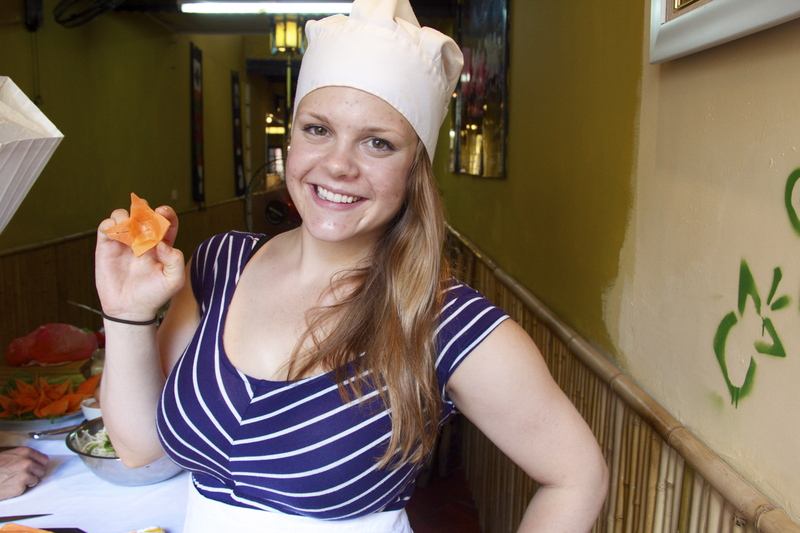 Taking five different cooking classes around the world has been one of the most satisfying, rewarding and fun challenges that I’ve been working on as I cross things off my bucket list. 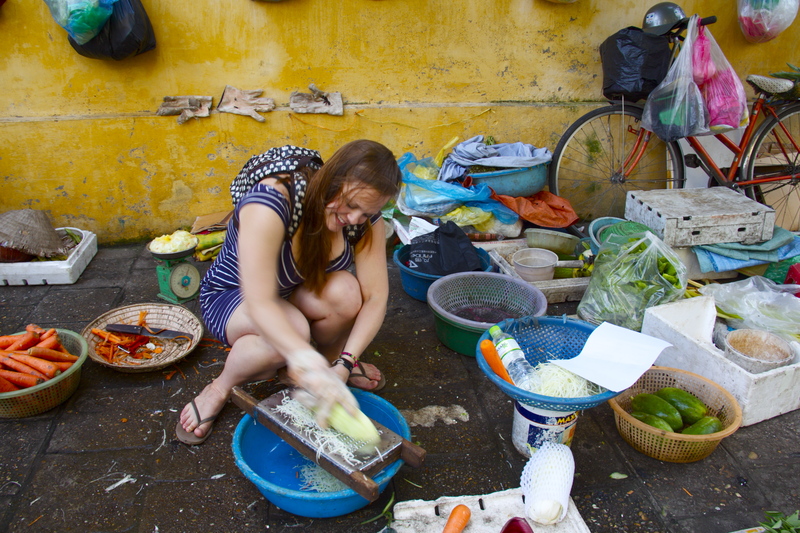 So far, I’ve taken a vegetarian cooking course in Thailand, a gourmet cooking course in Tasmania and, most recently, a traditional Vietnamese cooking course. I’m going to be posting my recipes from my most recent classes on my cooking blog, and will provide links to them in the post when they’re up and running! Unfortunately I arrived too late at night to book my class the night before it was meant to run, so I had to wake up early to try and secure myself a spot for the day. I booked the class through my hostel, and was pleased to find that it was only a few steps down the road from where I was staying. 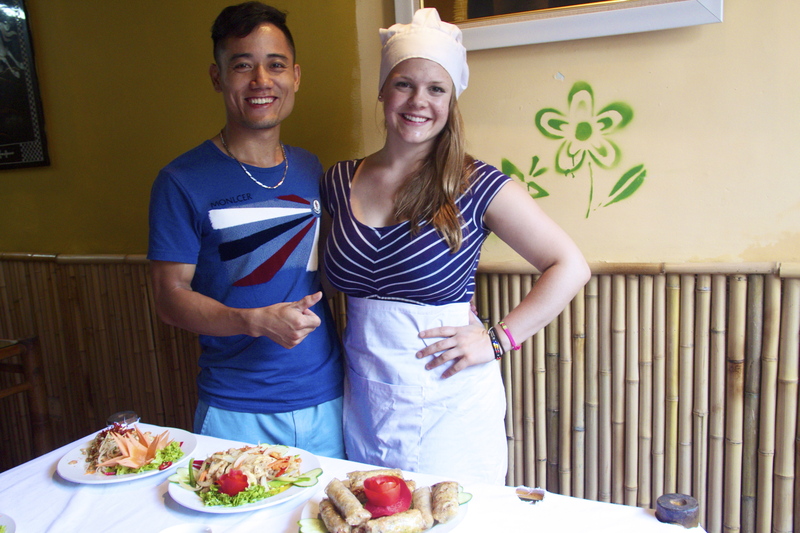 The class was run through the Blue Butterfly restaurant by a cheeky Vietnamese man named Tinh, who came and picked me up at my hostel promptly at 9:00 am. Having booked on to the course at seven in the morning the day of the class, I was a little bit nervous about the class size and what the quality of the class was going to be like. Thankfully my worries were totally unfounded– there was only one other person in the class, and she joined us around ten thirty am. Although our class size was small, Tinh noted that upwards of ten or twenty people could be in a class, which usually run twice daily. Tinh’s flexibility with booking was a major bonus for me and my super laid-back booking style, especially because he was happy to start the class within two hours of learning that he had a customer! 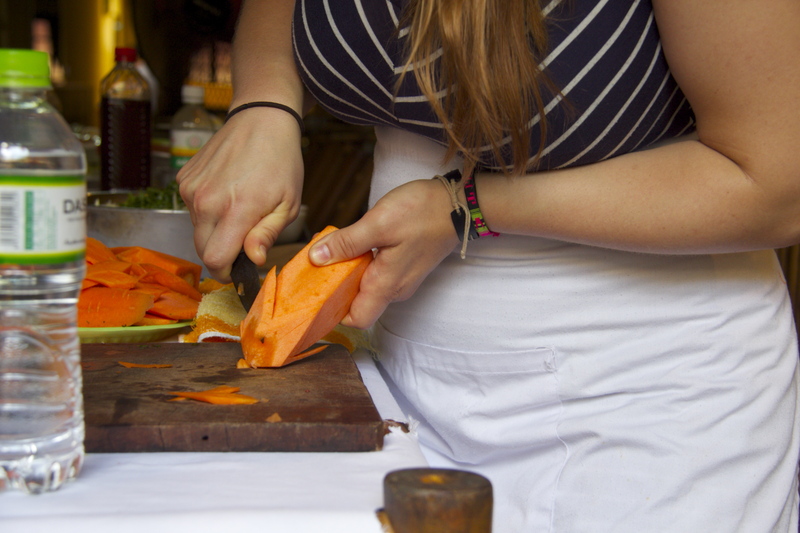 Putting some elbow grease in by grating papaya at the market. 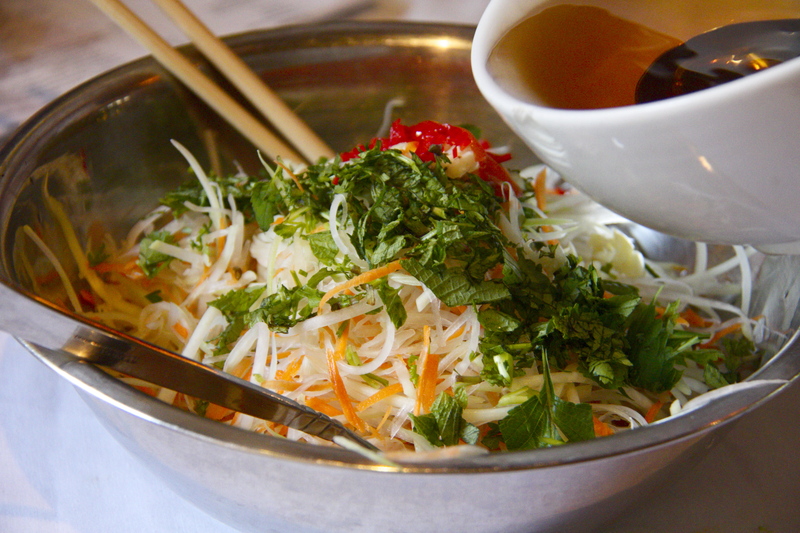 When I got to the restaurant I was offered a complementary tea while Tinh explained the menu, which consisted of traditional Vietnamese spring rolls and sauce, a papaya and glass noodle salad and a lemongrass chicken stir fry. 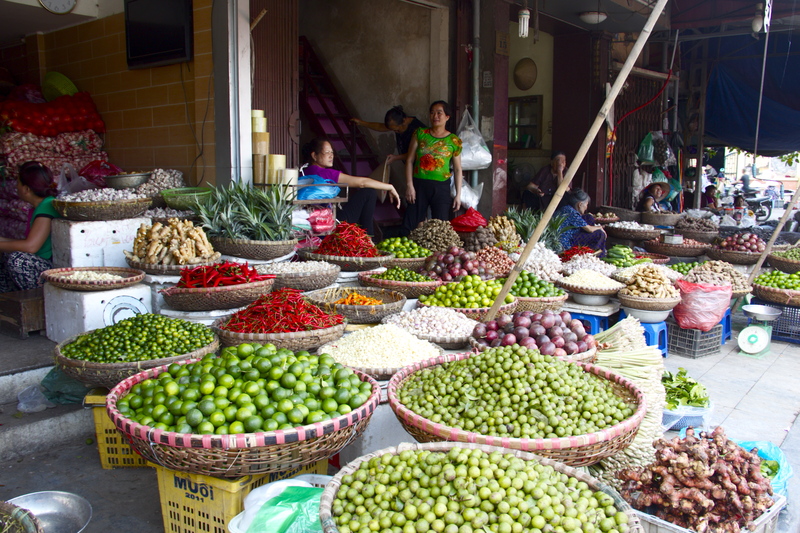 Before beginning the class, Tinh showed me around the local marketplace, where we sampled different fruits and meats from various vendors before buying some of the ingredients we’d need for our recipes. He took a lot of time explaining what the various fruits and vegetables available for sale were, what they’re commonly used for, and which features I should look for in the products if I was going to try and recreate the recipes at home on my own time. 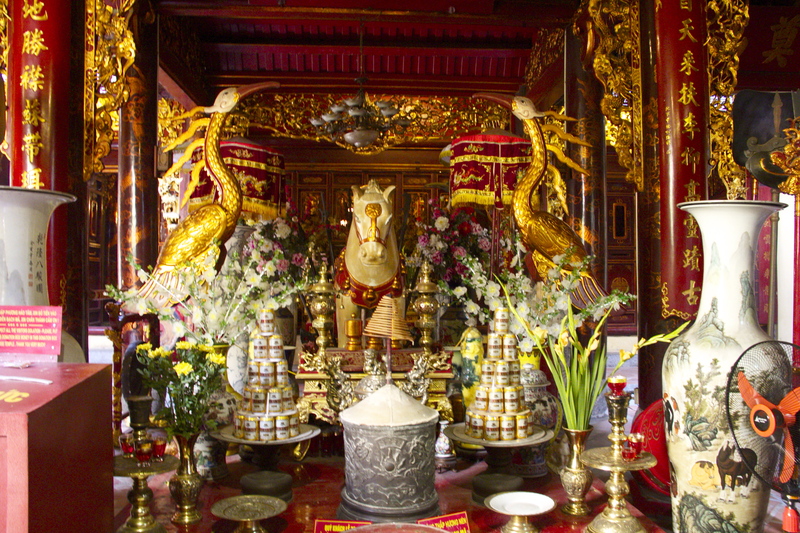 On the way home we stopped into a local temple, which was absolutely beautiful! Our preparation area consisted of two tables pushed together in the upstairs area, which was spacious enough for the size of the group and placed (thankfully!) underneath the air conditioning unit, which provided some necessary relief from the Vietnamese heat and humidity. The chef spoke little or no English, so Tinh served as a translator for me, and the other woman had her own Japanese language translator for herself. Tinh also was happy to play the part of the photographer and snapped literally dozens of pictures for us throughout the course. Tinh and I posing for a photo op. The first thing we learned how to make were some super fun garnishes, including carrot flowers, tomato roses and cucumber hearts. Unfortunately I lack the patience and the skill to make these well, and all my carrots came out chunky and I could not even begin to make a tomato rose to save my life, destroying a few perfectly good tomatoes in the process. In the end I think the chef donated a few well-crafted veggie garnishes to my cause so that I didn’t have any ugly plates of food, but I got to eat the mess-ups, so I wasn’t too disappointed. My chunky carrot flower garnish. The first dish we made was the salad, which involved mixing grated green papaya, grated carrot, coriander, mint, marjoram, peanuts and sesame seeds together, then tossing with a chili-garlic dressing and spicy dried beef. This recipe was amazingly easy and took almost no technical skill at all, but was incredibly flavorful and delicious, and would be (and was!) great for a hot summer day. 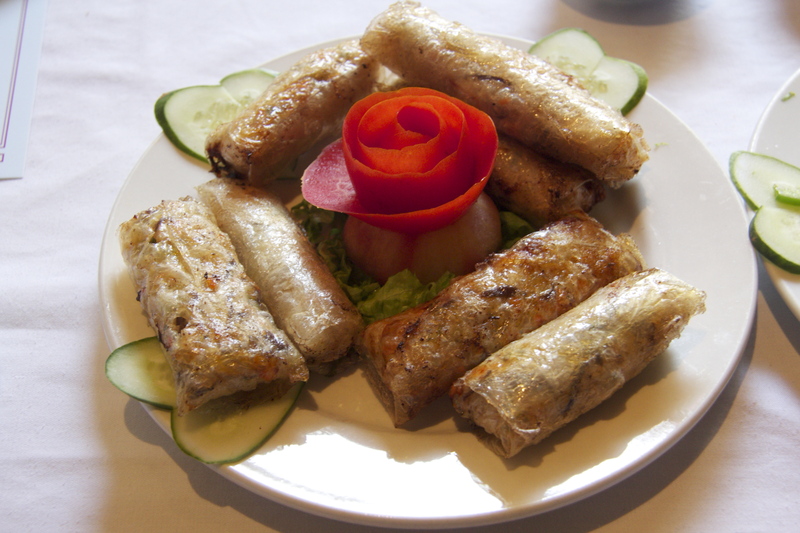 The second dish we prepared were the traditional spring rolls, which were filled with a mixture of pork, carrots, bean sprouts, onion, spring onions, rice noodle vermicelli, wood ear mushroom, eggs, shallots and pepper. We made a dumpling sauce that was sweet but tangy, and thankfully gluten free! All of the dishes we prepared during the day were actually gluten free, but most contained fish sauce, which I typically am not a huge fan of. We were told that we had to pick a light-colored fish sauce to reduce the fishiness and the heaviness of the flavor, and it definitely did the trick! The sauce didn’t taste fishy at all, and was a perfectly mixed balance of salty and sweet. 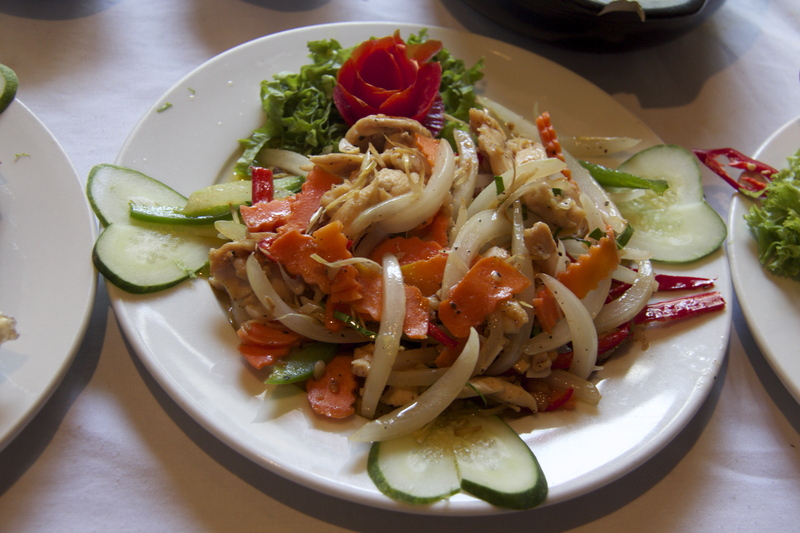 Our main dish was the stir fried chicken with lemongrass and chili, which unsurprisingly consisted of chicken, onions, lemongrass, chili, garlic, and various other stir fry veggies. Although the dish was pretty literally named, I was absolutely floored by how intense the lemongrass and garlic flavors were in the stir fry. Whenever I’ve tried to cook with lemongrass at home it usually just gets stringy and adds little flavor, so I’ve stopped bothering and used another flavor instead. Never again! I will definitely be making this dish in the future, as the lemongrass was not at all fibrous or tasteless. At the end of the class we were offered drinks again and had a table set for us to enjoy our food, which we most definitely did! The portion sizes were massive and there was definitely enough food there for at least two meals, but unfortunately I didn’t have any way to store my food, so I had to leave a lot of it on the plate. When I was on my way out Tinh gave me an extra recipe for my beloved Pho, which I can’t wait to try out on my own! Overall the day was amazing and such a value for what I paid (US30), and I could not recommend it highly enough. Value for Money: High value activity. Suitable for: Everyone! This class was very intro-level, and all the foods we prepared could easily be made at home. Spring rolls would be a great activity to do with kids. Recommend: Definitely. 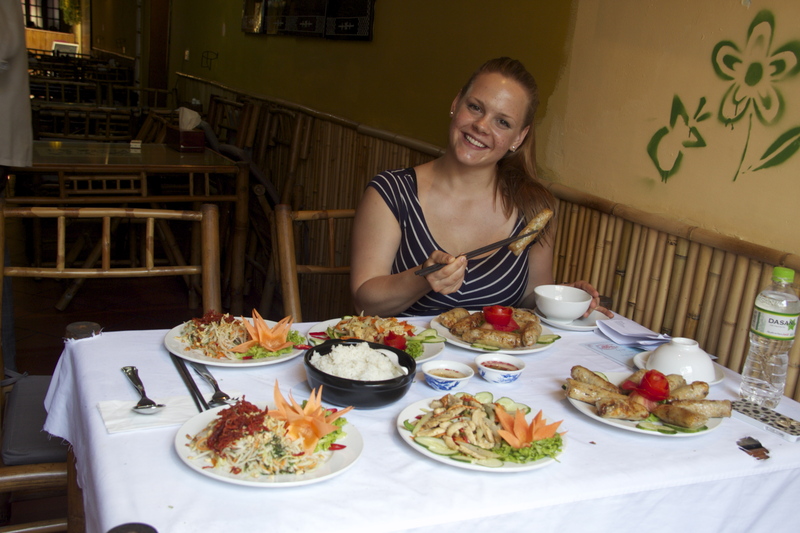 One of the best things I did in Vietnam, and for a pretty low price. I can’t wait to have you teach us how to cook these amazing things!